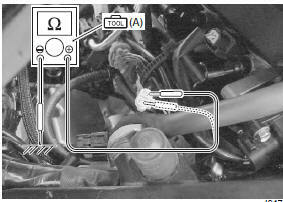 Suzuki GSX-R 1000 Service Manual: DTC “c12” (p0335): ckp sensor circuit malfunction. Suzuki GSX-R 1000 Service Manual / Engine / Engine general information and diagnosis / Diagnostic information and procedures / DTC “c12” (p0335): ckp sensor circuit malfunction. The signal does not reach ecm for 3 sec. Or more, after receiving the starter signal. Metal particles or foreign material being stuck on the ckp sensor and rotor tip. Ckp sensor circuit open or short. Check the ckp sensor coupler (1) for loose or poor contacts. If ok, then measure the ckp sensor resistance. Disconnect the ckp sensor coupler and measure the ckp sensor resistance. Are the resistance and continuity ok? Go to step 2. Replace the ckp sensor with a new one. 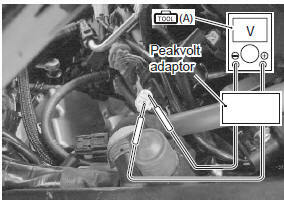 Crank the engine several seconds with the starter motor, and measure the ckp sensor peak voltage at the coupler. Repeat the 1) test procedures several times and measure the highest peak voltage. 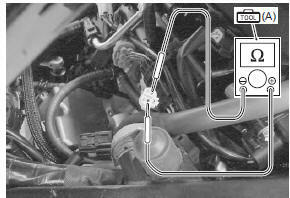 B or bl/y wire of the harness side open or shorted to ground. 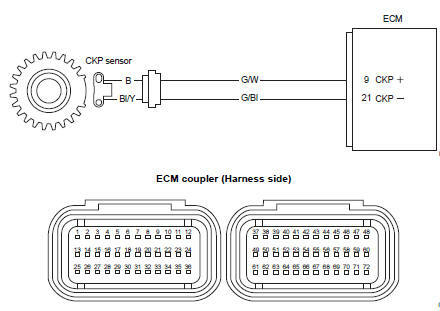 Loose or poor contacts on the ckp sensor coupler or ecm coupler (terminal “9” or “21”). If the wires and connection are ok, intermittent trouble or faulty ecm. Inspect that metal particles or foreign material stuck on the ckp sensor and rotor tip. If there are no metal particles and foreign material, then replace the ckp sensor with a new one. Refer to “ckp sensor removal and installation” in section 1c .